Zero’s threats and anger over the possibility of Obamacare’s obliteration were so unhinged that all Capitol Hill suspects someone leaked the results of the Supremes’ deliberations last Friday (3/30). There is now little doubt who that someone is: Justice Elena Kagan. She has been a close confidante of Zero’s since they both taught at UCLS in the early 90s. As his Solicitor General in the White House, she was a major supporter of Obamacare – causing demands she recuse herself. She has refused, and now, upset over a majority of her colleagues set to overturn Obamacare, she revealed their decision in a private conversation with Zero. This is evidently a first – a sitting Justice leaking a Court decision in advance to a President. In the 1930s, FDR’s chief political operative, Thomas Corcoran – the legendary Tommy the Cork – was often able to sniff out a decision in advance through his vast web of connections, and give FDR a heads-up. FDR had Tommy the Cork. Zero has Elena the Leaker, earning the contempt of her colleagues thereby. If for any reason SCOTUS approves obamacare, I think Kagan should be sued -on two counts1) she was in no way impartial on case-due to her previous involvementand 20 if leak can be proven, it is a case where she dishonored and sold out the SCOTUS-VIOLATION OF HER OATH..
Well I thought this court bragged about never having leaks. many agree with that comment. But leave it the marxist in the group Kagen to foil all the plans of the court. She and the court made a huge error letting her sit on this one. She should have been recused or ordered to. TO ME THAT IS BETRAYING THE OFFICE YOU HOLD. SHE SHOULD BE REMOVED FROM THE BENCH AS NOT TRUSTWORTHY. IF SHE IS ALLOWED TO STAY WHY WOULD THE OTHERS CONFIDE IN HER? 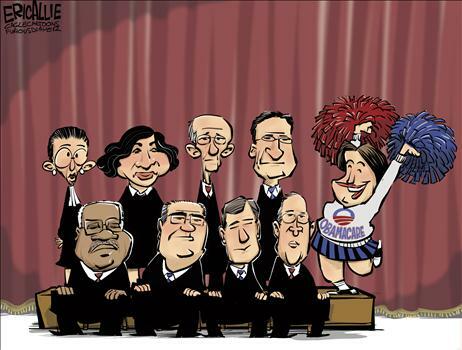 She’s not really on the Court neither is Sotomayor! An illegal President can’t appoint anyone! It would be illegal! The last three and a half years were just a dog and pony show. History will show that is true if there is a history and We The People live through this travesty.